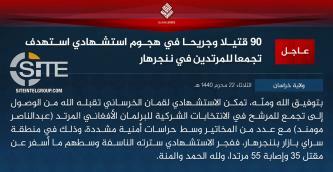 The Islamic State's Khorasan Province (ISKP) claimed killing and wounding 70 Hazara Shi'ites and Pakistani soldiers in a suicide bombing in Quetta. 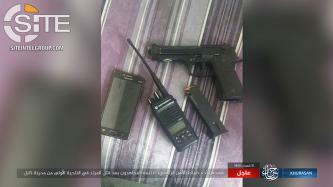 In its formal communique for attack at a Shi'a ceremony in Kabul, the Islamic State's Khorasan Province (ISKP) claimed firing a total of 77 projectiles at the site and deploying two fighters to engage the enemy. 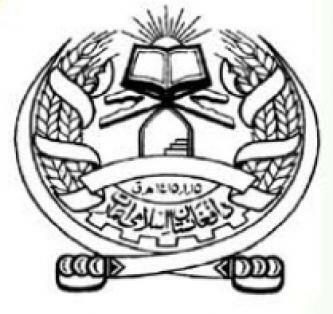 The Afghan Taliban accused American and Afghan forces with storming a prison in Badghis in which it was holding Islamic State Khorasan Province (ISKP) fighters captive. 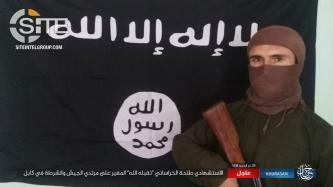 The Islamic State's Khorasan Province (ISKP) claimed thwarting a joint attack by U.S. and Afghan forces in Nangarhar, eastern Afghanistan. 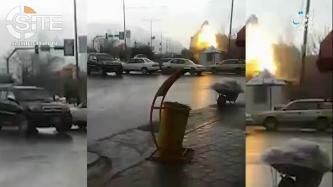 The Afghan Taliban claimed killing three U.S. soldiers in a bombing in Ghazni and repelling a joint offensive by American and Afghan forces on their positions against the Islamic State's Khorasan Province (ISKP) in Nangarhar. 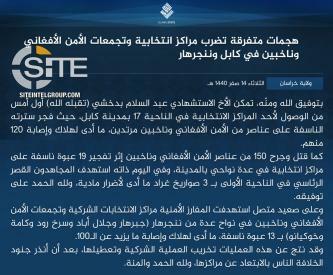 Shortly after 'Amaq News Agency reported a total of 160 casualties in an Islamic State's (IS) suicide bombing in Khost, Afghanistan, Khorasan Province (ISKP) issued a formal communique for the attack. 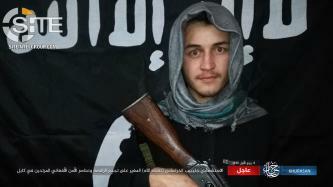 The Islamic State's Khorasan Province (ISKP) claimed inflicting 55 casualties among Shi'ites and Afghan security forces in a suicide bombing in the capital of Afghanistan, Kabul. 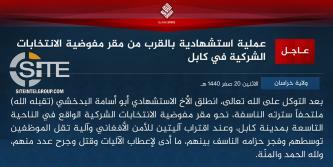 The Islamic State's Khorasan Province (ISKP) claimed bombing the USAID building in Khogyani district in Nangarhar, eastern Afghanistan. The Afghan Taliban again accused U.S. forces of supporting the Islamic State's Khorasan Province (ISKP) through airstrikes, this time charging that drone strikes on their positions in Nangarhar seek to halt their progress against the rival group. 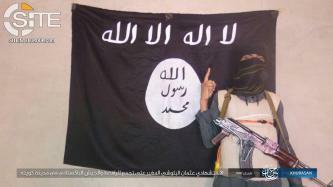 The Islamic State's Khorasan Province (ISKP) claimed killing 35 people and wounding 55 others in a suicide bombing at an election rally in Nangarhar in eastern Afghanistan. 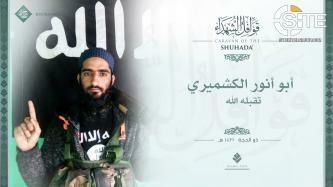 The Islamic State's (IS) Khorasan Province claimed killing an Indian intelligence official in the Kashmir Valley. 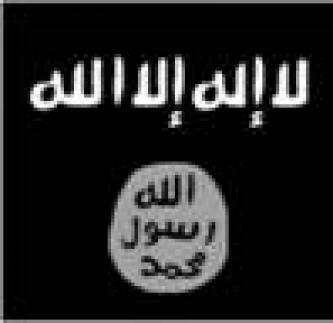 The Islamic State's (IS) Khorasan Province claimed inflicting 55 casualties among Afghan security forces and government staff in a suicide bombing in the capital, Kabul.